Back in 1973, when the first production 1300cc X1/9s were emerging out of Italy, but years before they were officially imported to the UK, Giampolo Dallara agreed with FIAT to develop a racing version of the X1/9. Dallara became the first to produce a series of racing exxies at their Parma factory. Dallara have recently been in the forefront of Formula 3 racing around the world with their latest chassis/ monocoque designs – and their successful projects litter the thirty years in between. Yet this X1/9 commission remains a firm favourite project with Giampolo. I can see why. Looking at the photos of these Dallaras they just don’t date. The lines and purposeful stance are as striking today as ever. The car’s handling and cornering abilities are legendary. They are pretty and functional yet enhance the Bertone original’s elegance. 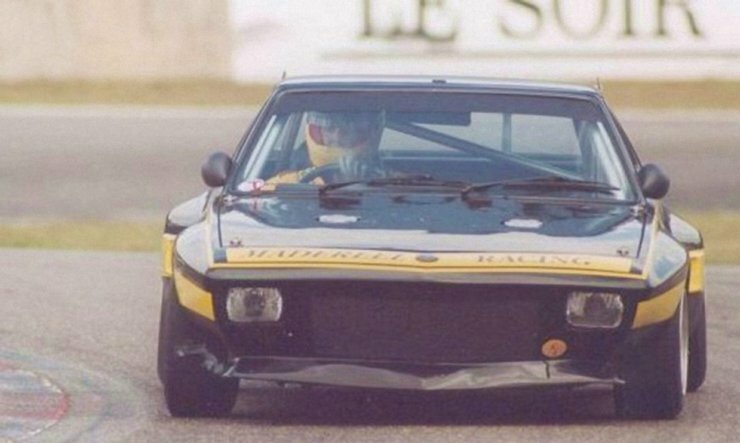 Actually Bertone designed the body panels for the Dallara too. The Dallara X1/9 retained the original passenger compartment, with front and rear space frames extended from the bulkheads to mount engine/box and suspension components. The initial Dallaras were built to Group 5 racing regulations. This was a silhouette formula allowing for maximum mechanical and weight reduction mods. – yet keeping the car’s production body outline. Few production components remained. To reduce weight, suspension uprights were cast from magnesium alloy, lower suspension arms were specially fabricated including lightweight radius arms. The fuel tank was re-located in front of the front bulkhead along with the brake and clutch master cylinders. In the earliest versions I’ve seen, the wing panels were retained – although now made of lightweight glass fibre. (In other words they didn’t make one-piece front or rear clamshells.) Dallara achieved around 260 kg weight savings over standard. Dallara had Campagnola make special 13-inch diameter eight spoke alloy wheels. These were split rims and lightweight – in keeping with the whole of the concept. The doors dashboard floor and sills were also replaced for the same reason. Thinner glass was used for the windscreen and small molded plastic side mirrors were located on the door quarter lights rather than on the door skins. The first Dallaras used Fiat’s 1300cc block with an in-house designed 16-valve head. Mechanical fuel injection was available very shortly afterwards. This layout gave around 192bhp at 9700rpm. Later 1600cc variants achieved over 200bhp with improved torque. Reliability proved to be a challenge though. The look of the engines was very different to the 16 valve designs from Abarth and Fiat/ Lancia at the time. Perhaps the most interesting comparison can be made with Lancias Sports/ Endurance turbo engine designs of 1979 - 82. (awaits page link in site). These are of course rare cars. Dallara offered a customised service to purchasers, and the exact number produced remains vague – because several were ordered as shells or rolling shells and also re-fabricated following accidents. Best figures suggest they built between 28 and 36 ‘cars’ from 1974 to 1978. There were at least 18 sold as complete cars. The Dallara design has also been replicated by several other builders. SFC contacts estimate that maybe another 20-30 similarly shelled racers have been built in the eighties and nineties. Can I Build a Look-alike? Yes, the wheel arch extensions are available. SFC has patterns for the front and rear spoilers. To look like the Dallara though the arches need some careful tailoring. These arches wont just ‘bolt on’ as the wheel centres within the arches were over 2.5 inches lower in the real Dallara. So if you put them on a standard car the wheel centre of the arch is 2 inches too high. (the Dallara wheelbase is very slightly longer too - gained from moving the rear wheels/engine back about 0.45 inch). Choose 16-inch diameter wheels for the rears and 15 inch for the fronts and be prepared to have the wings re-shaped to match. An X1/9 FIA roll cage can still be ordered at ‘off the shelf’ prices in the UK. Head Lights? The rectangular shape can be sourced from the later Fiat 128, or the 126 650 from 1976, or the later 127 special, and later small Fiat vans. Basically the smaller rectangular Fiat unit from the 76 to 81 era will do but buy them as a pair - as there are two different lens sizes. Some Dallaras had high intensity spots sourced from Italy for the endurance events. Side mirrors? Expensive from Italy, we are working on the tear drop look alternatives from UK. How much? If you’re prepared to wait and search hard £25k to £80k. Remember they’re likely to be tired today (rebuild budget needed). Dallara engines are collector’s items too! Sort the maintenance side out first. Where are they now? Most stayed in Italy France and Germany. We know of two in the States. How can you tell a fake? It’s a problem. Look for good provenance (records and documents), but Dallara’s records aren’t complete. We have contacts if you’re serious. What suspension layout did they have? Dallaras retained MacPherson struts with fabricated lower wishbones both front and rear. Later race replicas include twin upper and lower wishbones but the Dallaras didn’t. They kept to the MacPherson strut layout. What about the rear Wing, Drag & Aerodynamics? Remember this is the pre-ground effect era. A lot of drag in the X1/9 comes off the rear window area. The Dallara rear wing was fixed at the roof line and is intended to ‘clean up’ the air coming off the back window and rear of the car… and not to generate huge down force. Dallara personnel have suggested it was their best guess at the time rather than as the result of lots of wind tunnel testing. Later owners recommend the rear wing be extended either side of the roof edge, narrowed, raised just above the roof line and brought forward, for efficiency gains. Similarly at the front the air dam/ spoilers work ok but are prone to damage. Critical attention should be given to how much air is introduced into the radiator aperture, sealing the cowling at the radiator and the size of the bonnet exit apertures (which will create excessive drag if too large). What were Dallara's Race Results? In Group 5, ‘privateer’ Dallaras achieved many class wins when outright victories inevitably went to the bigger engined Porches and BMWs. In the UK Radbourne Racing achieved several outright wins with their variants. Who were Radbourne Racing? Then Wimbledon based and a London Fiat dealership, in 1976 they were importing X1/9s (ahead of Fiat UK) and offering RH drive conversions. Under Geoff Anstead a Dallara X1/9 was acquired for racing - and the resulting publicity. Radbourne Racing chose to increase the 1300cc-engine capacity with an 87mm bore and long stroke crankshaft. (Made by Gordon Spicer). Development continued every season and in 1979 a new shell was assembled along Dallara principles by Martin Slater (later of Lyncar). In 1980 this car was raced with a one piece front clamshell, a ‘stroked’ Fiat 1500cc engine with Cosworth pistons, 16-valve Dallara head, twin 45mm Weber carbs, giving 184bhp and weighing in at around 600kg. In this final guise it won the 1981 Donington GT Championship outright. How good are they today? It’s difficult to under state the potential of these cars – even today – in club racing terms. Perhaps the most striking comparison I can make about this Dallara is its dimensional and weight similarities with the Lotus Exige. Their wheel base, track, engine position and weight distribution are nearly identical. As later variants with improved spaceframes showed, all the Dallara concept really needs is improved aerodynamic aids, a modern powerful engine/ box and brakes – big brakes! Other Italian constructors made notable versions of the X1/9. Swiss based Filipinetti was one famous one - their first X1/9 recorded class wins during 1973. Their race engine solutions, (based on the original block) have been quoted at 190bhp. Perhaps they are better known for their 128 Corsa and Ferrari development but their X1/9 was effective. 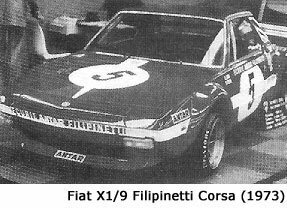 Team Filipinetti were based in Geneva, Switzerland during the early seventies, and then managed by Mike Parkes, (who had just retired from his illustrious racing career, and was about to join the Lancia Stratos development team). The Filipinetti 128 Coupes are probably more famous - as they carried off a World Championship during 1971. The X1/9's front suspension and brakes were based on the 128 Corsa version. Abarth were involved in developing the transverse racing version of the 1300cc engine, but Georges Filipinetti's in house designer was none other than Giampalo Dallara who worked on the 16-valve head designs! This world famous private race team had been founded by Georges Filipinetti in 1962. 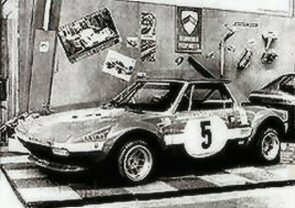 Scuderia Filipinetti cars played a major part in international sports car and single seater racing racing up to Georges Filipinetti's death in 1973. Abarth's Prototipo 2000 is discussed on a separate model page. There is an Italian site www.fibercar - offering a comprehensive kit for the Dallara as well as several other cars (X1/9 Prototipo, 131 Abarth, 124 Abarth...). Don't have any experience of the products offered, and there's no prices offered on the site that I can find. But they do have complete GRP doors (and frames) for the Dallara. Also its obvious that the products are coming from different places - the lay-up matting and resin techniques differ in the images across each of the car types. More searching is needed! Prima Racing of Nottingham can order a 4 wing plus front spoiler kit. (Though they are no longer listed in the product range they can special order them). There are small differences in the front wing profile with the original Dallara - though not too obvious. The 'angled' element coming away from the wing's top seam was built off a standard shape and is convex, rather than flat in the Dallara version (compare the front wing on the Blue Dallara Replica image with the Dallara publicity shots above). Dallara's website is interesting - but full of their single seater exploits! They have a classic cars for sale section to! Trevor Nicosia built a web page looking at his twin cam replica and the Dallara in 1998. I'm waiting for Mike Kason to finish his site so we can get a good look at this race replica with the TOCA Alfa 2 litre race engine too.